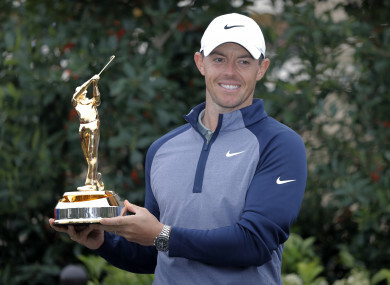 McIlroy holds the trophy at Ponte Vedra Beach. A BRILLIANT PERFORMANCE from Rory McIlroy saw the County Down native secure the Players Championship at Sawgrass on Sunday to cap off a perfect St Patrick’s Day. McIlroy adds Sunday’s crown — the unofficial fifth major — to his collection while picking up the $2.25 million prize. He now approaches the 2019 Masters at Augusta with a renewed confidence seeking to become just the sixth man to ever complete the career grand slam. “It’s very special, I just tried to treat it like another day,” McIlroy said after his victory. “Even though I’ve had close calls this year, they didn’t mean anything. They were good for me, I call them ‘remote misses’. It gives you even more hope to go again — I think all those experiences this year led me to this point. “Ultimately they were good for me because it got me over the line today. I birdied nine, I had a great chance on ten, birdied eleven and then before I hit my tee-shot on twelve I heard this big roar and I backed off. McIlroy bogeyed the 14th but held his nerve in the final stages with back-to-back birdies to reclaim the lead, before navigating the final two holes with two pars. “The final few holes were tough and to get that birdie on fifteen after the drop shot on fourteen was massive,” he said. “I knew sixteen was a good chance and then just to par the last two holes gives me a lot of confidence going forward. “This is a great start to the season. It’s a massive win, but the way I played on those last few holes gives me huge confidence. “If I hadn’t have won today I would have said that I don’t need a win going into Augusta, but it’s very nice to get a win, especially doing it on this golf course which plays a little bit similar to the way Augusta will play in a few weeks’ time. Email “Rory McIlroy wins The Players Championship after brilliant performance in Florida”. Feedback on “Rory McIlroy wins The Players Championship after brilliant performance in Florida”.